I invented something! Better than sliced bread? It’s not often you get to invent or discover something and name it yourself, yeah, you can discover a comet or maybe some infectious disease and choose a name or have it named after yourself. But in stroke of brilliance on this St. Patrick’s night it hit me like a bolt. 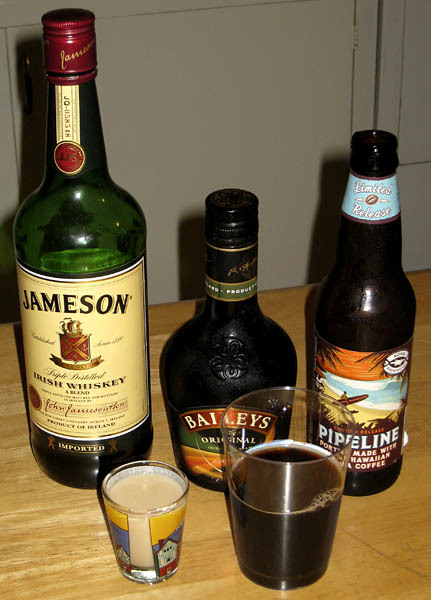 Okay folks, we all know what an Irish Car Bomb is: 1/2 Jameson’s Irish Whiskey, 1/2 Bailey’s Irish Creme in a shot dropped into a glass of Guinness beer. But when I was drinking one at the Mixx Bistro it hit me (actually it occurred to me the night before but I was too busy at Andi’s party having food and playing guitar) about this combo. Ingredients: 1/2 Jameson’s Irish Whiskey, 1/2 Bailey’s Irish Creme in a shot dropped into a glass of Kona Brewing Company Pipeline Porter. As tasty as an Irish Car Bomb but with a bit more punch. They say that Pipeline Porter is a seasonal beer so it won’t be on the shelves much longer, visit the Kona Brewing Company website and tell them you want it in their regular line-up of beers. I can at least proudly say I was the first to drink one. Tell your bartender you want a Kona Pipe Bomb and let’s get this rolling. Next PostNext Who was your first?